Being a parent is scary... Especially when you realize that you are literally shaping how another human being turns out. I've made my fair share of mistakes (and then some) when it comes to raising my children. Over the past few months, I've been doing a lot of thinking about what I think good parenting looks like versus what I actually do. I hit some of my parenting goals, but come up short in others. It struck me when I was watching an episode of Grey's Anatomy. The phrase "do no harm" came up and I realized that this key tenant for physician's could also be held as a sort of backbone for parenting philosophies. 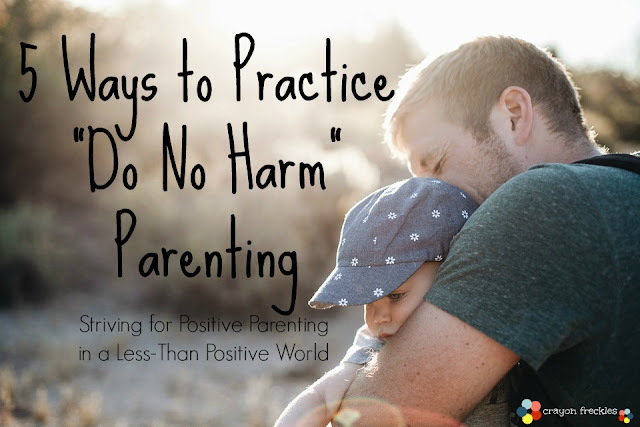 To be somewhat succinct, I'm going to share with you five ways things that parents can do in the practice of "do no harm" parenting. So many of us grew up in the time where spanking was commonplace. Many like to use the phrase, "I was spanked and I turned out okay." Let's look at this from another point of view. You make a huge error at work, breaking several department rules, and to punish you, your boss hits you. Sound okay? No? Well, neither does striking children who've been alive less than a decade because they've made a poor choice. There is a cognitive dissonance in our society where hitting a grown adult is considered illegal, but striking a child whom you've birthed is not. As parents, aren't we supposed to be the protectors? The trusted ones? I think of how I felt being spanked as a child... It's hurtful. Instead... If you feel yourself getting angry enough to strike your child, walk away. Take a break and come back when you can handle the situation in a way that is loving, healthy, and adult in manner. Some of you may have read my post on the "idiot" at the craft fair (her words, not mine). This interaction is still stuck in my mind to this day. Children are so easily labeled as "brats", "naughty", and other words of that nature for simply making mistakes that little people make. It seems we often expect so much out of our children without allowing them much room for error despite their age. Instead... Stress to your child that you disapprove of their behavior, not them as a person. This can be conveyed in a statement like, "It upsets me when you make choices like (insert poor behavior) because I know that you are a smart/kind/loving kiddo." Label the child's actions, not the child. Don't be rude, snarky, or mean. I know it can be tough to not let a snippy remark out when you're stressed to the max, no one is cooperating, and you are pushed to your very limit. But all that those types of comments do in stressful situations is heighten the emotions and create even more discord. Instead... Speak to your children with the same respect and kindness that you would want your partner or employer to use with you. Like the old saying goes, "If you can't say something nice, don't say anything at all." And sometimes as parents, our silence when things are going awry speaks more to hour children than our words do. I have some photos from my childhood that I'd rather no one see. There were the bare bottom bathroom pictures, the hysterical Santa photos, and the ones with my huge 80s glasses, permed hair, braces, and all around awkwardness. And we've all seen those "my child is crying because..." memes. The reasons for our children's upsets may be trivial to us. But in their little worlds, they carry huge weight. Instead... Before you post on social media, ask yourself how your child will feel if they were to see your post once they're teenagers or adults. Will it feel like an exposure they aren't comfortable with? Will they feel as though they were being mocked? The easiest examples of this are comments such as "Stop acting like a baby" or "Could you just act your age for once?" Making a child feel bad about their behaviors isn't going to stop the behaviors, only add more negative internal thoughts and anxiety about whatever is causing the problem in the first place. Instead... Issue if/then statements. "If you do not put on your shoes, then we can't go to the park." Address the child's behavior, not their character. Remember, your child is being the best little kid they know how to be. Be understanding, cut them a break, and above all, do no harm. I agree with all of these! Great post.